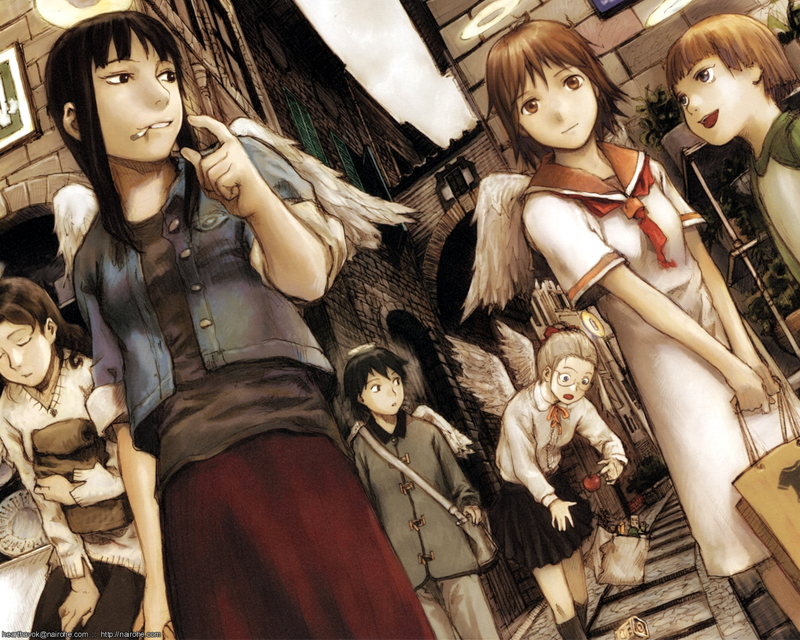 Haibane Renmei features some of the loveliest concept artwork I’ve ever seen, period. It’s a pity that the anime art never did justice to Yoshitoshi ABe’s lush drawings, because the story of Haibane Renmei is a thing of rare beauty. The dreamlike and melancholy atmosphere is mesmerising; only the flat art and animation threatened to take me out of the experience. 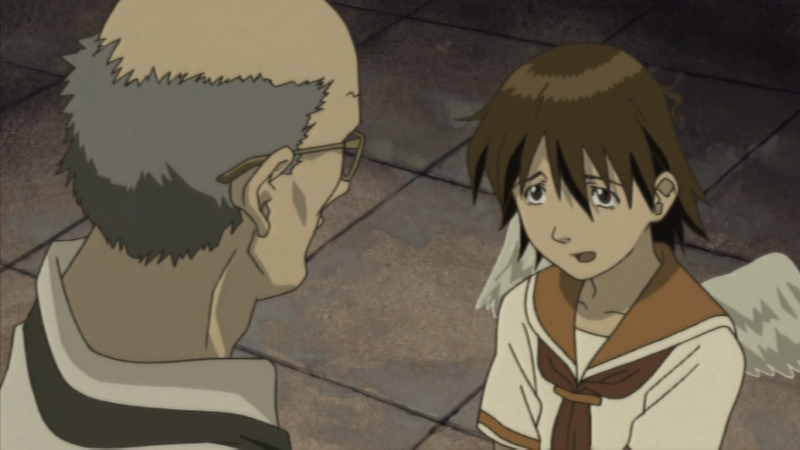 Haibane Renmei is an unfortunate victim of the technological trends of its time. In 2002, television anime had only very recently transitioned from traditional cel-drawn animation to digital paint. Now, I don’t know the ins and outs of digital animation, but I can’t help but feel that Haibane Renmei would have benefited more from the traditional approach. There’s a quaint, old-fashioned touch to the story’s tone, which clashes with the cheap and rather homogeneous look of early digital anime. Of course, I think the story is strong enough that I can overlook this particular weakness. And the final episode contains some really strong artistic choices in its own right. Haibane Renmei is never a bad anime, even when it fails to reach its full artistic potential. But instead of talking about the anime, I want to use this post to showcase Yoshitoshi ABe’s original artwork in order to spread my love and appreciation (and maybe hopefully convince more people to watch Haibane Renmei while I’m at it!). What I particularly enjoy about ABe’s style is that it’s clearly been influenced by traditional painting. It didn’t surprise me when ABe mentioned in the English DVD interview that he originally wanted to become a Japanese-style painter. Apparently, he took up anime-style art commissions to help pay for his art materials. It’s kind of ironic that he ended up becoming a cult figure in the anime world, but I’m glad that his artwork has an audience and that it pays his bills. 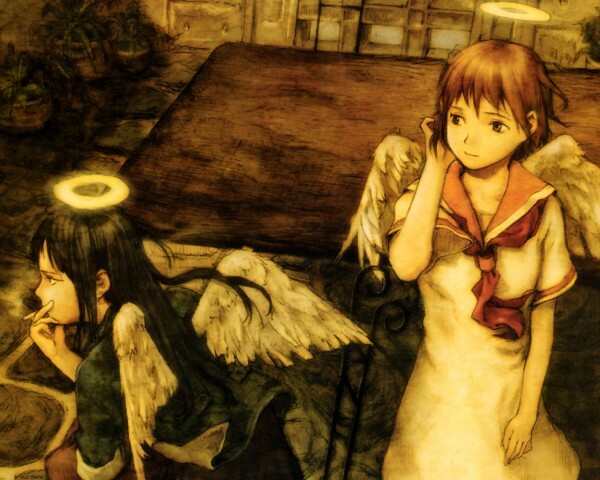 Unlike his other works (Serial Experiments Lain, Texhnolyze), ABe had full creative control over the character designs he drew for Haibane Renmei. He also wrote the story and scenario. Because of this, it’s easier appreciate the relationship between Haibane Renmei’s aesthetics and its theme through ABe’s art. 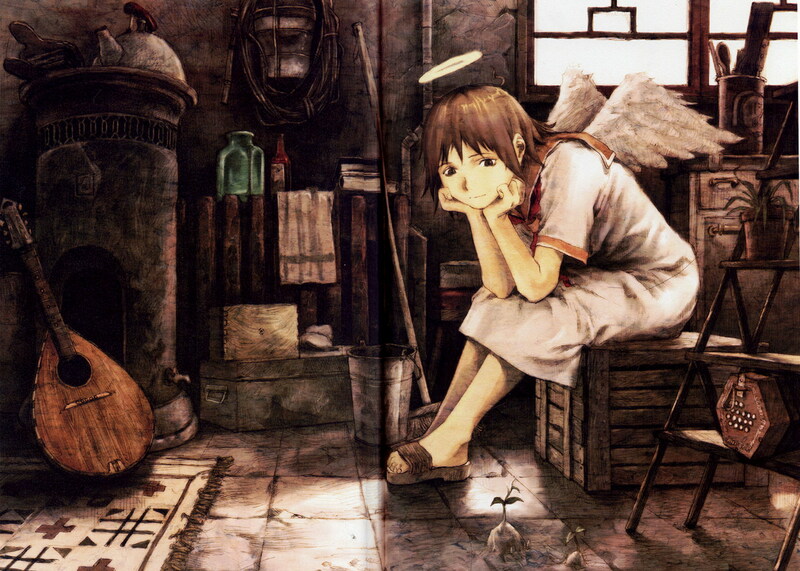 The level of detail in this piece gives Old Home, the setting of Haibane Renmei, a dusty yet homely sort of feeling. It gives the impression of a place where people really lived. Also note the fond and hopeful expression on Rakka’s face as she peers at the seedlings growing on the floor. You almost don’t notice them at first because they’re not the focus of the picture, but they’re definitely there. This picture summons an image of peace and tranquility. The colouring is light, even though the sky is grey, giving the scene a distinctive sense of ambiance. This picture might be my favourite of all. The orange glow conjures warmth and familiarity. Even though Reki is turned away from Rakka, the unspoken intimacy between the two girls comes across very clearly. As a side note, I really admire the attention to detail paid to the wings and halo. It gives the characters an ethereal quality that is missing from the anime. These pictures are definitely anime-inspired, but at the same time, they don’t feel very “anime-ish”. I wonder how much time ABe spent looking at the more famous Christian paintings. There’s a very conscious blending of styles which is fascinating to see. I could probably go on and on about all of this, but I’ll probably end up repeating myself. In any case, I hope this post has provided you with a brief glimpse of what makes Haibane Renmei such a distinctive and memorable anime. For what it’s worth, it’s still very highly acclaimed to this day, despite its dated elements. Haibane Renmei is definitely worth checking out if you’re a fan of slower-paced, contemplative stories, but I generally recommend it to anyone with a bit of patience. If you’re a fan of the series, I highly recommend you check out John Samuel’s series of posts which comprehensively covers every individual episode, along with tidbits about the story’s setting and speculations about the characters. You should also check out the religion-focused posts on Beneath the Tangles. Haibane Renmei is a very spiritual story, and the cherubic appearances of the main characters immediately bring to mind Christian theology. I’m an atheist and the ending moved me deeply, so take it from me that the themes of sin and redemption are universal. Posted on May 16, 2015, in Anime Analysis and tagged haibane renmei, serial experiments lain, texhnolyze, yoshitoshi abe. Bookmark the permalink. 11 Comments. 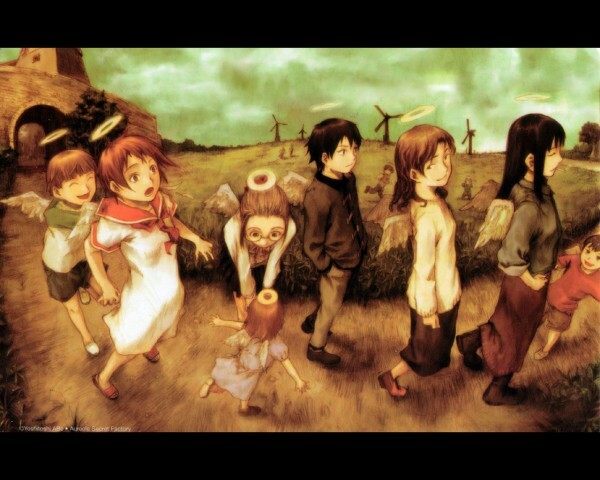 Haibane Renmei is one of my favorite anime, and ABe one of my favorite artists! I agree it would’ve been wonderful if the anime could have mimicked the style of ABe’s artwork*, but I’m going to guess a story like this would never be able to get anywhere near that level of funding. x_x Really, I’m impressed the anime was made at all; it’s so different from anything else that gets put on television. I eventually ended up reading Murakami’s “Hard-Boiled Wonderland and the End of the World,” which has a setting that supposedly served as inspiration for Haibane Renmei’s setting. I think ABe definitely took the general concept into his own very unique direction, but I found it very interesting to note the similarities and how the quiet, peaceful town could give off both an idyllic and an ominous air. A land that toes the line between sweet and bittersweet, perhaps? Ahh, I actually haven’t read Hard-Boiled Wonderland yet! I’ve been meaning to get around to that since I’m a fan of Murakami’s work and I really enjoyed the setting of Haibane Renmei. The peaceful yet ominous atmosphere was something I noticed about Haibane Renmei’s setting as well. You know, it did strike me as a bit curious that the focus of the series shifted away from the worldbuilding and towards Reki and Rakka. Normally, the focus in a story like this would be for the characters to find out the secrets beyond the gate, but on retrospect I appreciate that ABe put his own spin on the concept. And yeah, I really want to see the Despera anime as well! It’s been, what, six years in the making so far? Lovely post, and thanks for the kind words! That is some really nice art. Traditional art is incapable of simulating the rich water colors and digital paint work in Yoshitoshi ABe artbook. Digital art is more than capable of doing this now but the problem is cost-effectiveness of such methods. Traditional animation still uses flat cell tone paint and markers. Gouache is often used for background but rarely for every animation cell (Prohibitively expensive and time consuming). Also Yoshitoshi does use digital painting for most of his artbooks. http://muddycolors.blogspot.ca/2016/03/one-of-those-days-development-work.html ABe pionered a similar digital work to give the texture like appearance.